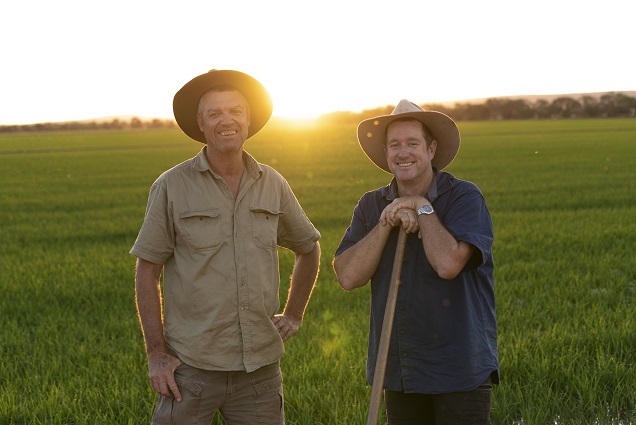 Yenda ricegrowers, Chris Gribble and his cousin, Craig Bardney. DESPITE very low water availability and high water prices across the Riverina, two Yenda families – the Gribbles and the Bardneys – are proud to each be growing rice for the 90th year since their first crop in 1928. 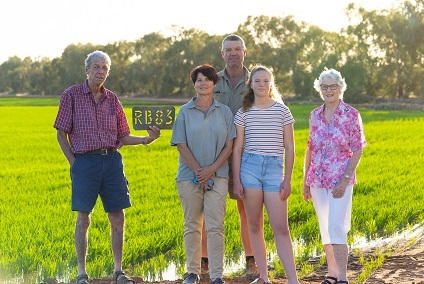 For third generation rice grower Chris Gribble, it is his family’s 89th crop (they missed a year during the Millennium drought) on ‘Ropa’, near Yenda, which was first settled by his grandparents Roy and Marjorie Gribble. Mr Gribble’s parents Paul and Anne carried on and now Chris operates ‘Ropa’ with his wife Belinda and their three daughters. Paul, Chris, Anne, Claire and Belinda Gribble. Technology use, water efficiency, irrigation layouts and yields have all improved dramatically over the years, as footage from the 1950s on ‘Ropa’ shows (see link below). When asked about the long-term outlook for growing rice Mr Gribble said: “Our yields, quality, and soils are just getting better. There is no reason we can’t do this for another 90 years and only build on what we have now”. This crop year, Mr Gribble has grown 53 hectares of medium grain Reiziq thanks to a combination of good country with clay subsoil for efficient water use, a layout of terraced, bank-less fields and a focus on recycling all water on farm. The Gribbles are among the region’s top 25 per cent of growers, regularly producing yields of 12.5 to 13 tonnes per hectare and rice that tests at the upper end of whole grain quality. They have been also been achieving 1.25 tonnes of rice per megalitre of water used, exceeding the Riverina’s “holy grail” of water use efficiency of 1t/meg of water. Demonstrating the effectiveness of their system, Mr Gribble said that after growing rice they could grow a winter cereal crop, usually wheat, using the residual moisture in the soil. This year they averaged 6t/ha for their wheat crop, making it their best yet. Mr Gribble said rice was a sustainable crop due to its water efficiency. Australian rice growers use 50pc less than the global average and extensive research and development has increased yield per tonne for each megalitre of water used by 9pc since 2012. Along with his cousin Craig Bardney, Mr Gribble is pleased they are able to continue to grow rice this year. Rice growing in Australia has come a long way since the 1950s? The video below shows the Gribble family harvesting rice with horse drawn equipment back then. This is a great video and story of just how fantastic agribusiness is in Australia. Thanks.